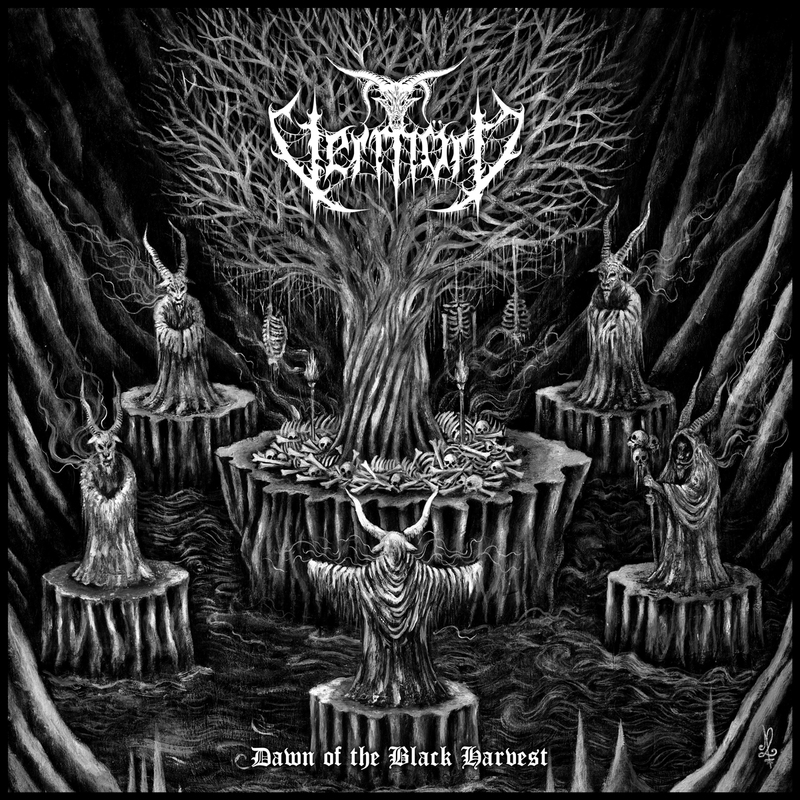 Vermörd plays a blend of black metal and technical death metal, making the sound fast, intense and ferocious. Their music represents a definitive equilibrium between the two distinctive forms of extreme metal. Having said that, I’d like to categorize their style leaning a bit towards technical death metal, as their composition suggests. The EP kicks off with an epic keyboard intro, which leads to the outburst of their violent brand of black/death metal. The band uses double guitars- one of them plays harmonized tremolo guitar riffs and the other frequently changes its tempo and scale, giving the sound a more tech death flavor. However, the song ‘Dark Harvest’ has more black metal feels to it; sharp, muted black metal melodies backed up by a gloomy atmosphere. On the whole, the band pays more attention to make the sound complex and violent (Plagued Eyes from the Scrolls of Xafmirtas, Encrimsoned Baptism). The bass guitar is not given enough space, although they can be heard over the guitar. The drums are pretty good actually. The drummer does a great job by varying it throughout. The drums may not sound much technical, but build a solid platform for their version of blackened death metal to stand on. Production-wise, the EP has a strong sound. The guitars have been given priority on the mix. The bass guitar is kept louder than your average black/death metal records. The overall sound lacks some fidelity. The vocals deserve a separate section. The vocal deliveries include different styles; the vocals are mostly death grunts. There are occasional shrieking and snarling voices too. The vocals power up the overall atmosphere of the level to a different level. Dawn of the Black Harvest marks a solid start to the Vermörd’s career. The band might not sound ‘original’ or ‘unique’, but I can assure they have got something exceptional to offer for the fans of black metal, death metal and technical death metal. Give it a listen and decide for yourself. Recommended.